Don't forget to celebrate the 6th Anniversary of this blog this month! 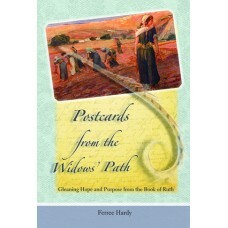 Enjoy the sale on Postcards from the Widows' Path---it's only available from this site---not on Amazon. Please tell your friends, too. Click here or use the Annual Sale tab at the top of the blog. Thank you! As always, if this post arrives to you by email, please click on the title line at the top of this page to get to the WCP blog itself where you'll be able to order. Thank you for your book sale, Ferree! Well thank you, Candy! It's a special way for me to commemorate that day when life changed forever-in-an-instant for me, and to give back a bit of what God so graciously gave me in Jesus Christ--not only life after death in eternity, but also a new life after the death of my husband Bruce. I want widows everywhere to experience both, and I know this book can help. You're so thoughtful, Candy, and I appreciate your sweet friendship, even though we've never met in person, we know each other by heart.